The Environmental Transport Association has hit out at changes to the law that mean cars emitting less than 100g of CO2 per kilometre travelled would be exempt from paying Vehicle Excise Duty (road tax), while motorcycles are still required to pay. Chancellor Alistair Darling outlined the plans in his first budget last week, under the auspices of rewarding motorists for driving ‘green’ vehicles. Despite Darling’s aim, the rate of road tax paid by motorcyclists is set to double in 2009, the ETA states, with the annual charge for a typical 125cc commuter bike set to grow from £15 per year at present, to £33 in 2009. Andrew Davis, a director at the ETA, says the increase “makes a nonsense of the revised rates of vehicle excise duty,” and that “a case must be made for motorcycles,” because they tend to emit less CO2 and use less fuel than cars. The ETA’s criticism is damning because it is a not-for-profit organisation that campaigns for sustainable transport, as well as providing carbon-neutral breakdown cover and insurance products. 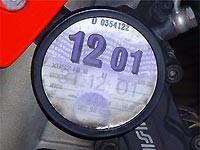 Figures from the organisation state that the average CO2 output for motorcycles is 110g/km. Can we take the politicians seriously this time?